A memorial gift to Save Maumee is an extraordinary way to honor April Langschied also lovingly known as, April Brewster-Smythe. Your gift will not only touch the life of April, but you are helping the local community by your choice to support green initiatives that April vehemently supported in her life. The amount of the gift will be confidential. As an added benefit to you, you will receive a receipt for your donation, which is a 100% tax deductible. When giving online, simply indicate that your gift is a tribute or memoriam in the “comments” section, and fill out the appropriate information. You may also designate your gift via mail. 1. Make the check or money order payable to Save Maumee Grassroots Org. 2. In the memo portion write April’s name, the individual you are honoring. For more information please contact April’s son, Chris F. Langschied at (260) 615-1975 or by EMAIL. April Brewster-Smythe, a.k.a. 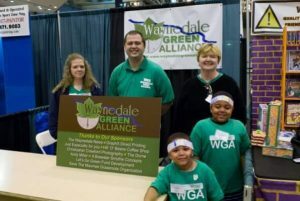 April Langschied, founder of Waynedale Green Alliance and Green ABC’s, has been an inspiration to Save Maumee’s river advocacy. We first met when she contacted me to speak at her conception of imagination called the “Waynedale Green Alliance – Sustainability Fair” in 2009. When we met for the first time, at a local coffee shop to discuss the event, I could tell right away that her passion and drive would inspire others to embrace green living. She exemplified tangible ways to increase awareness and I was supportive of her vision right away. April felt a strong necessity to educate the younger generation to make a change for a better future. Her enthusiasm is contagious, and I encouraged her to continue to share her wisdom to the masses! I appreciated her insight and opinion as both an activist and friend. Over the years, April and I had shared many thoughts and ideas. Her creativity was exemplified in the concept of the Green ABC’s and other events she has solely pulled together. She has incorporated our grassroots efforts in the letter “W” for Watershed – Over the past 13 years Save Maumee has been dedicated to raising awareness and facilitating ecosystem restoration projects to improve OUR waterways and those downstream. She knew that our focus has on the Maumee because the St. Joe and St. Marys come together to form the Maumee River. Upstream water quality must be improved to revitalize the Maumee Watershed; to protect and restore the environment and improve the economic, aesthetic and recreational value of our waterways. April has been a supportive force and an encouragement to our work, promoting the health of our waterways whenever she could. Along with our working relationship, I appreciated her friendship because of that dynamic personality and contagious laugh. I miss you my friend. Thank you April for all that you did…the world is a better place because you were a part of it. I know you did all you could do in this life. Many people talk about changing things for a better future, April worked to change them.